We’re almost at the end of this hiatus, and I haven’t posted anything really since right before I went off to grad school for the summer. But that doesn’t mean I haven’t been up to some witchy business in the meantime. Today I thought I’d share a few of the things I’ve been doing over the past six weeks (well, other than performing detailed exegeses of 18th-century English poetry and seeing about 27 different versions of Shakespearean performances). The first thing I should tell you is that I was living on campus, and this campus just happens to be a beautiful rural campus right at the edge of Appalachia. My access to folklore primary sources was much abetted, and my opportunities to get out in the woods increased a good bit. 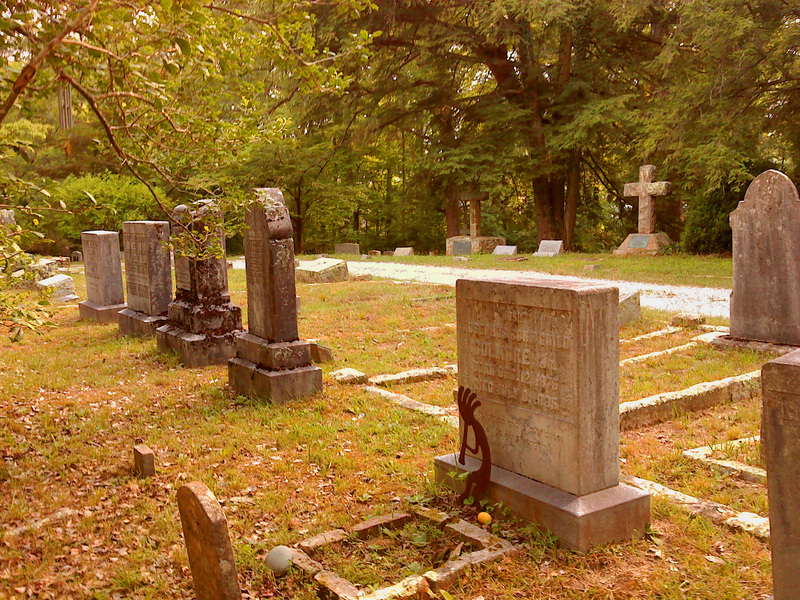 Secondly, my dorm was immediately across from a beautiful old cemetery. As you can probably guess, I spent a good bit of my time there. 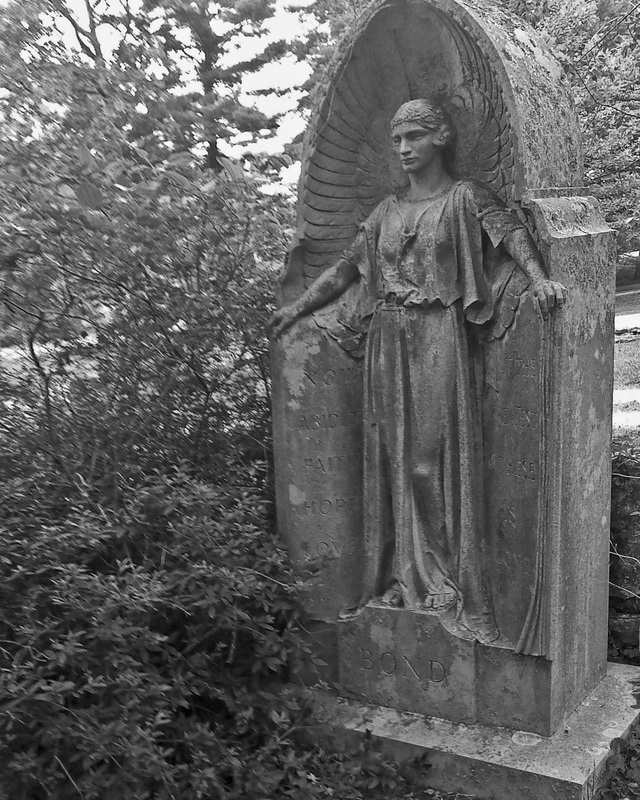 Here are some photos of the amazing graves and other funerary décor found in the old boneyard. The graves here date back to around the mid-nineteenth century, so they aren’t incredibly old, but many of them are gorgeous. And they are certainly older than lots of other cemeteries in the area. 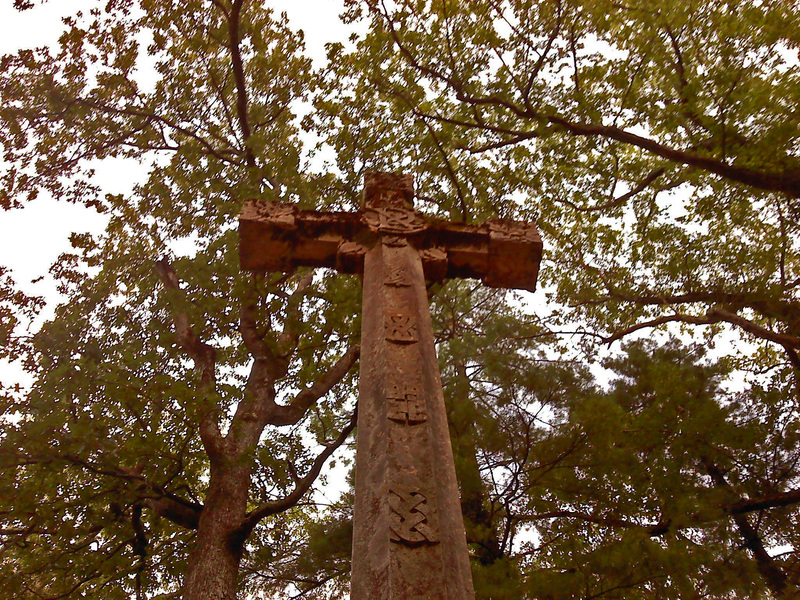 This also happens to be a religious school, so there are plenty of beautiful crosses here, too. 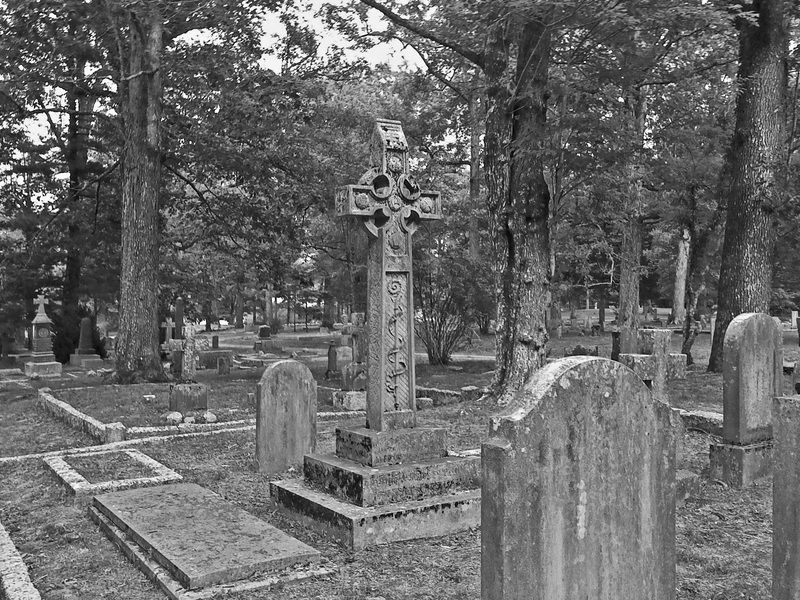 Since it’s as close to Appalachia as it is, the cemetery has a strong Celtic influence in the stonework. The time I spent here mostly involved taking late night (or often midnight) walking tours of the area. Among all those graves and under a very starry sky, it was pretty amazing. If you’re wondering whether or not I encountered “anyone,” though, I have to say the answer is no. I did bring offerings of food and whiskey several times, leaving them near the small side gate rather than any specific grave (since I wasn’t trying to contact anyone in particular, that made sense to me). 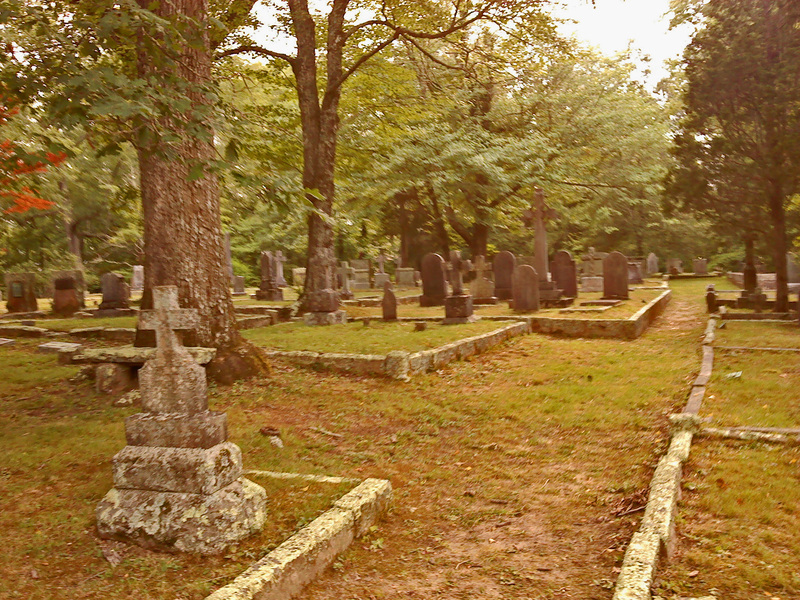 Wildlife abounds near this cemetery, so I often heard things wandering out in the dark just beyond the light’s cast. I even occasionally met other folks taking late night constitutionals among the headstones. Since I wanted to do well in my schoolwork, I also made up a potent little mojo bag, which I carried in my pocket. I anointed it daily with either Crown of Success oil or some local whiskey, depending on what seemed appropriate for the day. As far as I can tell, it worked magnificently (though I’m still waiting to get final grades back…mojo don’t fail me now!). I may outline just how I made this specific mojo bag later this week in case there are other students looking for a little “oomf” in their studies. Of course, a huge portion of my time was dedicated to reading completely non-magical texts (Paradise Lost, vast quantities of Shakespeare, a number of Restoration-era authors like Swift, Pope, and Dryden, etc. ), but I also had time to work my way through a few magically inclined books as well. I’ll be posting some reviews of those as time permits this coming week, so stay tuned for those. The beautiful natural surroundings of the school also afforded ample opportunities to get outdoors. Though the heat was stifling some days, trees always provided comforting shade and occasional mountain breezes helped cool me off, too. So many of the plants that grow in that area have magical connections: elder, sumac, sweet gum, passionflower, poke berries, and blackberries all grow wild. I did some harvesting, particularly a good bunch of sassafras, so I’ll try to get some info up on that at some point, too. Last, but certainly not least, I also had long drives to and from school on the weekends, so I filled up my iPod with lots of witchy podcasts and caught up on some of my favorites. I also got to hear some new ones (at least new to me) that were excellent. If you haven’t checked out Pagan Hooligans yet, it’s a great show and the hosts are a lot of fun. They’re recording their adventures in paganism from day one, and it’s really a refreshing perspective! I’ve also started really listening to and enjoying Iron Powaqa Radio, which has a decidedly sassy side and always makes me smile. So that was my summer in a nutshell, I suppose. I’m going to be trying to get back in the swing of regular posts as soon as possible, and hopefully there will be another podcast up fairly soon, too. Until then, thank you all for your patience and support! Feel free to post, email, discuss, and generally share your own New World Witchery here, and we’ll look forward to hearing from you! Thanks for reading! This entry was posted on July 26, 2010 at 9:30 am and is filed under General Information. You can subscribe via RSS 2.0 feed to this post's comments. Greetings Cory, good to hear from you! I must say I’m a little jealous at the beautiful environment surrounding the school your attending. Down at the University of Southern Mississippi, we are in the middle of Hattiesburg, so its lacking in such scenery. 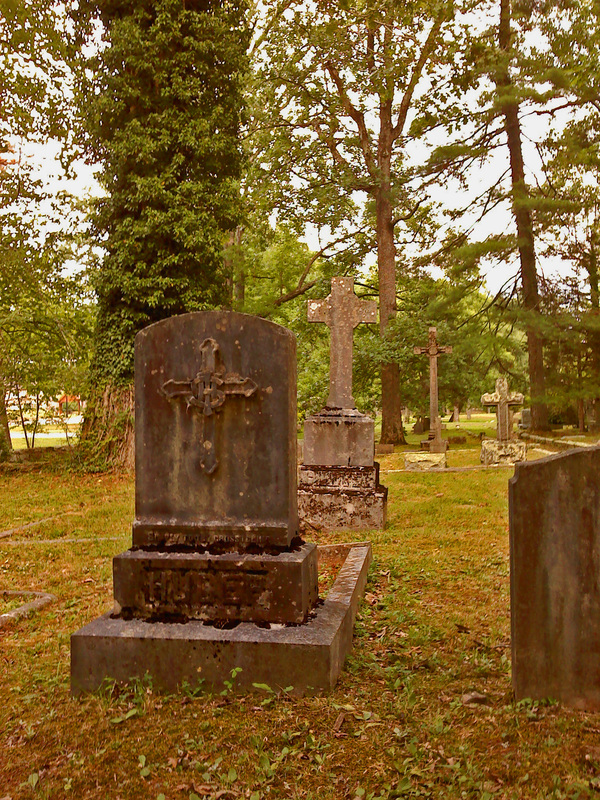 Your pics make me want to go to my family’s cemetery, which is out in the country, though I haven’t been in about 15 years. I too have been doing summer courses, though not in a master’s degree, so I won’t even attempt to compare. I devised some sorcery myself to aid in my studies, and since you will probably be sharing yours, I’ll preemptively share mine. Its an “Academic Success” working. For the best results timewise, I suggest doing this working on a Wednesday when the moon is waxing, some time after 6:30 am/pm but before noon/midnight. Work in drawing sympathetic motion. This isn’t necessary, as you know, it is just the sympathetic timeframe. Herbwise it involves Cinquefoil, High John Root, and Cinnamon. I do sigil work, and did so with this working, but I would have to generate the sigil digitally to share it, so I suggest making your own for “Academic Success” or just use a name paper. Carve your name on a red candle, as well as the sigil and the words “Academic Success” and anoint the candle with Van Van Oil. From this point you do whatever ritual stylings work for you, and set your light. Take the remains (candle wax and herbs) and wrap them in the name/sigil paper and either bury it, keep it as a charm, or use it as the meat of a mojo hand. This working is ongoing: every Wednesday I light a red candle anointed with van van and the sigil/name carvings. As of right now, I have one exam left and as long as I show up to the thing, i should get an A in the class. Overall, I am looking at a 4.0 for the semester. Now I’m not saying set a light and go play video games, study is still involved. I have worked at my studies. I find myself more motivated, and the information seems to come to me easier and I seem to understand it much better. Assignments just seem to “fall together,” for lack of a better explanation. So for me, I have had success with this working. Great spell! And one I’ll probably need to use next year when I go back to school! It’s actually not all that different from my own academic success spell, only instead of a red candle, I put the ingredients in a red mojo bag. I also used a few other herbs (like rosemary for mental focus/memory) and included a Psalm in my charm (but that’s just something I like). I’ll probably do a more thorough post at some point on academic success magic, but I LOVE your spell! I’ll definitely be linking back to it when I discuss using magic for education. Great stuff, Odom! Keep posting! Ah, I almost did Rosemary as well, but I wanted to keep my herbs at 3. I may alter to see how that works for me. Which Psalm do you use? I like to work with Psalms as well, though I did not for this particular working. Very nice. I am Appalachian with roots in Kentucky and Southern Ohio that go back to at least the mid 1700’s. Just finishing my Bachelors and considering grad school. My degree is in fine arts and media with heavy emphasis in theatre and literature, so I can relate to the Shakespeare et al! That’s quite a pedigree 🙂 I bet you’re a folklore nut like me! Do you spend hours on JSTOR looking for folklore articles, too? Good luck with your degree! I wound up waiting almost 10 years after my BA to start grad school and I feel a little bit behind, so if you still have some academic energy left when you get your undergrad, I’d recommend doing the next level as soon as you can. Are you studying any particular branch or period of literature? What kind of media are you working with? Thanks for writing! Be well! Thanks for the love on your last podcast episode and blog entry. I was surprised when I heard you mention our show. Happy to plug y’all, Isaac! I enjoy your show a lot! Keep up the great work! LOL! I am 55 years old, went back to school at 50. Started working on my degree in 1977, but wives (yes plural, two), etc. , just life itself interferred. I have about 250 credit hours! Guess I should consider applying for graduation! Ha! That’s what I get for assuming 🙂 Hope I didn’t offend! Well, I’m glad you’re working on completing your degree. Good luck! I’m glad that you are back. It sounds like you had a great time exploring your surroundings in between your studies. Your mojo bag and Odom’s Academic Success spell sound great. I will have to try them since I’ve decided to go to college after graduating from high school twenty years ago (yikes that’ a long time!) I need all the “oomf” I can get. I’m attending my local college and hopping to become a massage therapist. It’s not nearly as hard as graduate school but, man, the names of all those muscles is kind of hard to memorize, especially when you have been out of practice for twenty years. But I think that, everybody needs/likes a good massage, right? Moonlight: The non-traditional college student, i.e. not fresh out of high school, is becoming more common by the day. The regional campus that I attend was set up in 1946 for returning soldiers, and has been a strongly non-traditional campus ever since. I was at first concerned that I no longer had that sharp, fresh, young mind; and about being an old guy surrounded by, at best patronizing, kids. These fears all turned out to be groundless as I made the Dean’s list, and many young friends. I doubt that you will have any trouble learning anything. I think you’ll do fine Moonlight! As Colt said, a lot of older students are returning and doing great. I am 27 myself, and while I’m not very old, I’m no spring chicken. In my field of study, I have learned a bit about adult education, due to the fact that I am taking a non-traditional route to my degree. I am in a program called “Interdisciplinary Studies.” What this program is about is taking disciplines of interest and combining them into one degree. While you lose the single, and deeper focus one degree can give, you gain a broader view and different ways of handling whatever it is you are studying for. I am combining Religion and Philosophy, Anthropology and Sociology, and Art all into a major I call “Conceptual Analysis.” The idea is through having a broader grasp of cultures and thoughts, I can analysis a society more thoroughly, providing more accurate studies and statistics. During the classes that tie these disciplines together, we have learned a few things about adult education. Children and adults learn differently due to a variety of reasons, but studies have shown that older adults tend to do better at learning in a college setting, as they are more apt to have a more focused interest in the course of study. This could be due to a variety of factors, such as hormones already being firmly settled, having more life experiences, and so on. Point is, adults make great students, and I am sure you’ll do fine! Sorry for rambling so much :X. Thank you both Colt and Odom for your encouraging words, I really appreciate them. Now that we are in the 8th week of summer school I’ve gotten to know a lot of my classmates (all 19 and 20 years old except for one lady that is older than me) and they are all wonderful people. I’m glad I decided to go back to school. It’s a wonderful feeling!